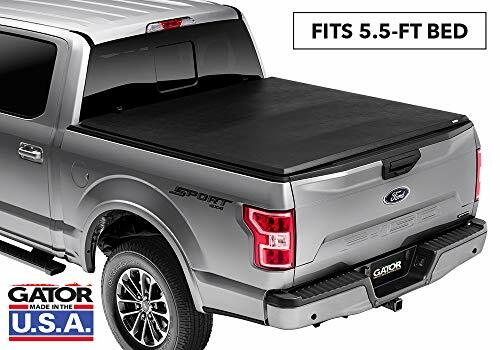 What Is The Best Tonneau Cover in 2019? →What Is The Best Tonneau Cover in 2019? For all you truck drivers out there, getting the best tonneau cover can seem bewildering. With so many products glutting the market, analysis paralysis can set in. Protecting the contents of your pick-up truck bed against the elements is essential. Today, we’ll walk you through 5 of the best tonneau covers so you can choose appropriate protection without wasting time or money. 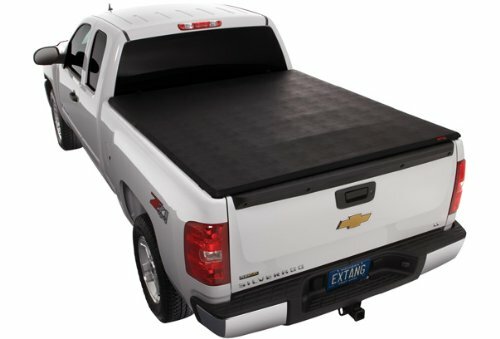 What Style of Tonneau Covers Are There? How Easy Is The Tonneau Cover To Install and Use? What Are The Benefits of a Tonneau Cover? Many of these tonneau covers are vehicle-specific so we’ll flag clearly which trucks they work with. We’ve done our best to curate as wide a range as possible so there’s something for everyone. If you own one a mighty Dodge Ram, Tyger Auto produce the go-to tonneau covers for this beast. Super-simple installation and rugged build quality means this cover is built to stay the distance while keeping your possessions safe and sound. The lifetime warranty is the crowning glory with this first-class tonneau cover. This nifty tonneau cover is designed for a range of Dodge Rams. It fits the 1500, 2500 and 3500 models. Age-wise, all trucks from 2002 to current models present no problem. As with all tonneau covers, make absolutely certain about compatibility before committing to purchase. The cover is secure and durable while low-slung to streamline the look of your pride and joy. It comes pre-assembled with a mounting hardware kit thrown in. You’ll also get a handy LED light provided. Measurements are 69” x 26” x 4”. The weatherproof seals help to protect any cargo against the elements as well as any passersby with dishonorable intentions. For a top-tier tonneau cover without needing a bank loan, look long and hard at this fine example from Tyger Auto. Tonno Pro produces a broad range of tonneau covers including this 6.6 feet short-bed option ideal for Silverados and Sierras. With 4 bonus gifts included and an extremely competitive price tag, this fold-up cover is the perfect fit for anyone hunting down a bargain. And thinking of fit, as with all covers, make sure of sizing and compatibility before purchase. Tonno Pro is a hard-hitter in the tonneau cover space and this model, the 42-108, is designed for the Chevrolet Silverado (2014-2018) and the GMC Sierra (2015-2018). The vinyl polyester fabric is solid enough although some users have complained about lifespan. The rubber seals keep the rain out nicely on a 6.6 feet short bed. The cover works in an open or closed position so it’s a highly versatile solution. Dimensions are 30” x 73” x 5”. As an added kicker, you’ll get some work gloves, vinyl cleaner, tailgate seal and a worklight thrown in making this tonneau cover and accessories a pocket-friendly way to improve the looks and security of your truck in one neat bundle. Famous for manufacturing tonneau covers since way back in 1982, Extang are a legend in the industry with just cause. This cover is certainly not cheap but consider it a long-term investment since build quality is unparalleled. Also, think of the money you’ll save at the fuel pump as a way of recouping that investment for the win-win! 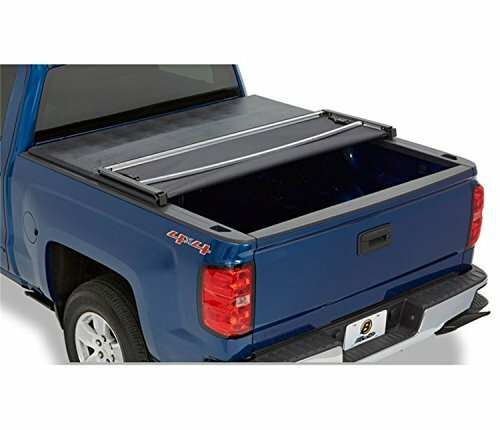 As with all tonneau covers, make sure that this Extang tri-fold will fit your truck before rashly purchasing. Everything comes pre-assembled and you won’t need any tools or extra hardware to get going straight out the box. The hard-wearing vinyl is built to withstand heavy punishment and the steel-bracketed frames are rigid and rugged. The strength of the tonneau is found in the frame and the Extang is class-leading in this respect. Although you get an incredibly durable tonneau cover here, the inbuilt bonus is that it’s also pretty lightweight considering the amount of materials involved. This is most certainly not the cheapest tonneau cover on the market but you should think of this as making an investment in your vehicle. One immediate way you’ll get a return on that investment is with improved fuel economy due to a more streamlined ride. Next up we’ve got a very specific tonneau cover, the fantastic Gator Tri-Fold which is designed for the hulking Ford F-150. If you have one of these formidable trucks, this neat folding soft cover is hard to beat. Available in 2 sizes (5.5 feet and 6.5 feet), the Gator works well with 2015 – 2017 F-150s. If you’re the proud owner of the best-selling F-150, this soft tri-fold tonneau cover is a cinch to install coming entirely pre-assembled. All you need to do is line it up, clamp it down and you’re ready to roll. Made from weather-hardy vinyl and packing aluminum bows for a combination of strength and lightness, the cover is also weather-sealed to make absolutely certain your cargo remains protected whatever the elements. The lock on the tailgate adds an extra layer of security to an already rock-solid unit. Considering the extremely low price point of this tonneau cover, the limited lifetime warranty is an unexpected bonus removing any real reason not to buy this tonneau cover. Protect your possessions, enjoy the sleek design and save a few cents at the fuel pump into the bargain. As with most tonneau covers, this folding beauty works with only certain trucks. If you have a 2007 – 2013 Silverado or GMC crew cab style without the bed management system, this is the obvious choice of cover. Take note this will not work with the classic style truck. Robust build quality, outstanding weatherproofing and a keen price mean this cover represents money very well spent. As with every tonneau cover, make sure that you are buying the right one for your vehicle. These covers are absolutely not one-size-fits-all. 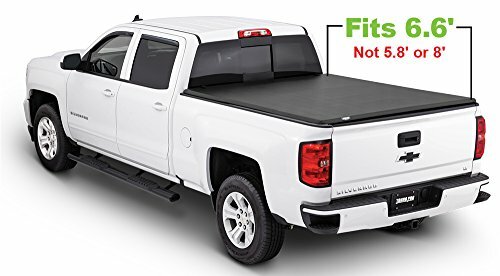 In the case of this Bestop folding soft cover, it works with the Chevy Silverado or GMC from 2007 through 2013 as long as there’s no bed management system on your truck. 5.8 feet long, this low-profile cover has a hinge and rail along with reinforced corners to guarantee stability. The whole cover is secured neatly to the front bed rail of your truck with some durable straps. Made from a polyester/vinyl with leather grain, you’ll enjoy a winning mixture of a soft weather-resistant cover that’s relatively lightweight and still remains nicely flexible even during frosty cold snaps. Installation couldn’t be easier and the tonneau cover can be removed in a flash if you want to take advantage of using the whole truck bed for transporting larger items. For a perfect combo of build quality, performance and price, the Bestop deserves a place on any list of the best tonneau covers. Now you’ve got a nice spread of tonneau covers to choose from, we’ll give you a few handy hints to make sure you get the best one for your requirements. Any type of tonneau cover is designed to cover up the bed of a lighter pick-up truck. First thing’s first though, what type of tonneau cover would best serve your needs? Hard Folding Tonneau Cover: A highly secure option, hard folding covers are generally made from reinforced polymers meaning nobody will slit your cover with a knife. These covers are particularly valuable if you’re a contractor with lots of valuable tools stored onboard. They are highly weather-resistant as an added bonus. Soft Folding Tonneau Cover: Similar in design but made from soft fabric, these covers are a very affordable choice if you’re operating on a tighter budget. Soft covers are also a breeze to install. Retractable Tonneau Cover: These retractable covers extend from a canister mounted at the bulkhead of your truck. Usually made from plastic or aluminum, retracting covers have multiple locking positions for added flexibility and ease of access. Roll-Up Tonneau Cover: Using a combination of rails and a heavy-duty tarp, roll-up tonneau covers are another sound budget-conscious solution to secure truck storage. You can roll it out of the way completely if you need to make use of the bed for transporting bulky items. Low-Slung Tonneau Cover: These low-profile beauties are almost invisible when the truck is viewed from the side making them ideal for the design-conscious truck driver. You can get all the security of a tonneau cover without ruining the streamlined look of your truck. 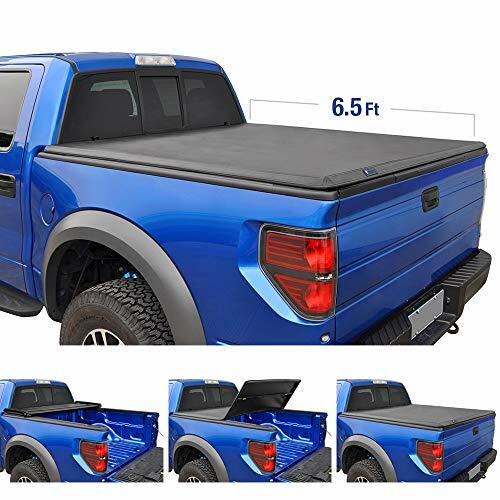 Hinged Tonneau Cover: Functioning like a lid, these covers are normally hinged from the front of your truck bed and they come in both hard and soft variants. Lightweight and durable, this style comes pre-assembled so you’ll be good to go straight out the box. Not all tonneau covers are created equally as you’ll see from the above list. Think carefully about how practical you are and choose a cover that meshes with your abilities when it comes to installation. Many covers come pre-assembled and most are very easy to fit. Consider, too, how easy or difficult the cover is to operate. If you’re constantly in and out of the back of your truck for work supplies, the last thing you want is a cover that’s a pain to use. Using a tonneau cover is a great way to protect anything in the back of your truck from the wind and rain but what are the other benefits of these nifty devices? Aesthetics: If you’ve spent plenty of hard-earned cash on a truck, it stands to reason you’ll want it look good. What’s the first thing that tends to get dented and battered, though? The bed. Rather than ruining the aesthetics of your pride and joy, covering up these dings is a great way to improve the look of your truck with minimum effort. Security: Perhaps the key selling point for tonneau covers after protection from the weather is security. Whether you’ve got sports equipment, tools or groceries left exposed in the truck bed, they’re a beacon for any passing thief. Why leave things to chance? Investing a small sum in the best tonneau covers gives you complete peace of mind knowing your belongings are safely locked away from prying eyes and sticky fingers. Fuel Economy: The hidden kicker of buying a tonneau cover is that you can notice an improvement in fuel economy. Why is this? Well, since the cover substantially reduced air drag, your engine will suffer much less stress and you can end up seeing quite a difference at the fuel pump. We trust this look at the best tonneau covers on the market has given you plenty of inspiration. Investing in protection of this nature will keep everything you need inn the back of your truck safe, sound and safeguarded against the winds and weather for a modest cost. Come back soon as we continue to expand our site to cover all aspects of your beloved ride.